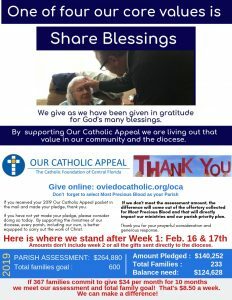 Our Catholic Appeal 2019 – We are off to a great start- Thank you for your support! Our Catholic Appeal mobilizes our entire diocesan family to support ministries that benefit far more people than we could ever reach alone. You can visit www.cfocf.org/oca to learn more about the life-changing impact of your gifts. 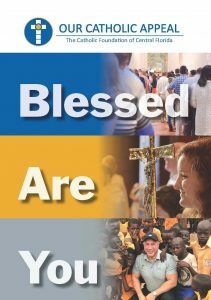 If you received your 2018 Our Catholic Appeal packet in the mail and made your pledge, thank you. If you have not yet made your pledge, please consider doing so today. By supporting the ministries of our diocese, every parish, including our own, is better equipped to carry out the work of Christ. Our parish assessment is $264,880. Once we achieve this goal, the majority of the additional funds will be returned to our parish to support our own special needs and ministries. Our Catholic Appeal is an annual opportunity for every member of our faith family to support the life-changing work of the Diocese of Orlando. Gifts to Our Catholic Appeal fund a wide variety of ministries that serve our nine counties in ways that no parish could accomplish alone. 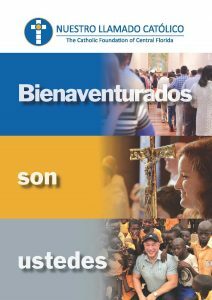 Your gifts to OCA are the sole source of funding for 27 ministries that benefit every parish, mission, and school in our diocese. In addition, OCA gifts provide critical support for outreach programs such as Catholic Charities of Central Florida, Hope Community Center, and our schools in the Diocese of San Juan de la Maguana in the Dominican Republic. See the list above. In many ways, OCA is similar to a parish offertory, which covers routine expenses and allows the parish to carry out the day to day work of the Gospel. In the same way, OCA strengthens our entire local Church by helping to sustain our Diocesan ministries. Empowered by the Eucharist, we humbly commit ourselves as a welcoming community to grow in faith and share Christ’s love through our joyful witness and selfless stewardship. Imagine Our Parish encountering the Catholic faith not just on Sunday, but all throughout the week! Free Faith Formation for every parishioner. A gift from your parish! NEW USERS: Click here to Sign Up Today! © Copyright 2019 - Most Precious Blood Catholic Church, Oviedo, FL - All rights reserved.